Judges removed their wigs inside the courts. Guards at Buckingham Palace were allowed to stand in the shade. Some workers wore shorts to the office. Britain faced one of its hottest days on record Wednesday — so hot that even the pavement melted on the roadways. Though other spots in Europe sizzled in similar temperatures, this is a country ill-equipped for its infrequent brushes with temperatures nearing 99 degrees and beyond. Commuters facing journeys on London's Underground railways without air conditioning seemed particularly troubled, with London's Evening Standard measuring temperatures at 117 degrees. Operator Transport for London did not dispute the figure — though it says it takes no temperature measurements of its own. "I don't even want to talk about it," said Jean Thurgood of East London, fanning herself frantically during her early morning commute on a stuffy bus. "It feels like the hottest day of the century." Across Europe, health officials and other leaders warned people to stay out of the sun and to drink plenty of water. French President Jacques Chirac urged people to be cautious, as French officials said as many as nine people who died recently may have been victims of soaring temperatures. In Spain, two people died during a heat wave that has seen temperatures climb above 104 Fahrenheit. 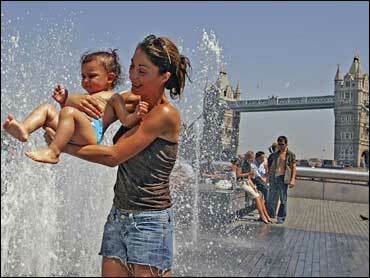 At 4 p.m., when daytime temperatures generally peak, Berlin was 95, Brussels 93.9 and Utrecht in The Netherlands 95.5. In The Netherlands, the Nijmegen 4-Day March was canceled after two participants died in the extreme heat. Some 300 people taking part in the popular walk became ill Tuesday in temperatures close to 95 degrees; 30 were hospitalized. In Britain, many people simply sought shelter indoors as the mercury rose. By mid-afternoon, the temperature at Charlwood, near London's Gatwick Airport, hit 97.3 degrees — the hottest temperature ever recorded in Britain in July. Sancha Lancaster, spokeswoman for Britain's primary weather forecaster the Meteorological Office, said that by late afternoon temperatures west of London could eclipse the current record of 101 degrees in Faversham, Kent, on Aug. 10, 2003. The average temperature in southeastern England in July is 70 Fahrenheit — and that figure has been the nighttime temperature the past few days. "There's no air conditioning anywhere, it seems," said 24-year-old Australian Mark Jones, who is living in London this summer. "In Australia, we're used to this, but here, a lot of people don't even have fans." City officials took extra precautions to protect people from the heat — but there was little they could do besides tell people to carry a bottle of water along. Andrei Danilov, 32, dutifully cradled mineral water on a central London bus. "It gets worse and worse every year," he said. "I can't stand it." At the historic Royal Courts of Justice, judges were allowed to remove their traditional wigs for court proceedings. One of Britain's largest trade union federations, the Trades Union Congress, issued a statement urging people to wear shorts. The two-hour shifts of the famed royal guards who stand outside Buckingham Palace were reduced to one hour at the beginning of the week in preparation for the heat, said the London headquarters spokesman, Col. David Sievwright. Decreasing shift times is rare, he said. Construction workers in Cumbria in northwestern England dumped crushed dust rock on highways in response to the soaring temperatures because the pavement was attaching itself to vehicles, Cumbria's county council said in a statement. Zookeepers at the Colchester Zoo gave lions ice blocks flavored with blood. Monkeys got blocks containing fruit. But the heat failed to dash one of Queen Elizabeth II's annual garden parties. Nearly 8,000 people lined up to enter Buckingham Palace. "Oh my gosh, it's so hot," said Sonia Read, as she flapped her fan. "I have never seen anything like this."